Watching the Olympics, people witnessed the athletic feats of thousands of athletes from all over the world. 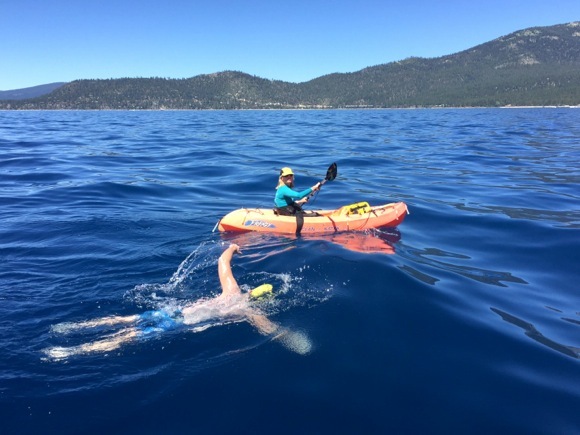 Last month, Menlo Park orthodontist Scott Kaloust accomplished an amazing feat of his own, completing the 21-mile swim across Lake Tahoe and raising over $4,000 on water.org to provide clean water to those in need. During the swim, a crew of friends and an observer accompanied him in a ski boat and on a kayak to provide support and nourishment. The observer kept a record of the time, speed and conditions of the swim to ensure that he completed it according the preset regulations. “It took a bit longer than I wanted … that was definitely unexpected, but that’s kind of the nature of marathon swimming,” Scott says of the swim, which took him 15 hours and 41 minutes. He began at the Camp Richardson Beach and swam north to the Hyatt Beach in Incline Village. The hardest part of the swim for Scott was the cold, especially during the night and the early morning when the sun had not yet risen. While sunrise made the temperature slightly warmer, it presented a new set of problems. “When the sun comes out, you see the shore and it looks relatively close … it’s mentally tough,” he admits, knowing that there was still miles to go until shore. Despite these challenges, he never felt like giving up. “My crew was worried because I started slowing down, and that’s often a sign … but I never felt like that,” he says. Though his crew initially feared that his decrease in spend was due to hypothermia, Scott attributes it to leg cramps. Luckily, he recovered and began gaining speed again after sunrise. By starting the swim around 9:00 at night, Scott swam under a nearly full moon and was surrounded by the lights from shore. “The conditions were beautiful,” he says. Once he got closer to shore in the daylight and “could see the bottom and boats all around,” he knew that the end was near. While he is currently focused on marathon swimming, Scott’s favorite Olympic swimming event remains the 100- and 200-meter backstroke, since he used to compete in those races as well. For the future, he says that he won’t swim across Lake Tahoe again, but swimming the English Channel is a possible next venture. I can introduce you to Jamie Patrick that is a long distance swimmer and did the Channel and the Length of Tahoe.